Free fiction Friday here on the eighteenth day of our celebration! This time a classic weird tale from Francis Marion Crawford. If you are interested, here’s an insightful personal essay on the story by Claire Armistead in The Guardian. And, of course, bear with me for yet another reminder about Halloween: Magic, Mystery, & the Macabre and its new seasonal stories. It’s not too late for you to share the word about it and get a chance to win a free copy…but it will be soon! Do you hear the tide? Gloomy sound, isn’t it? Sometimes, about this time of year—hallo!—there it is! Don’t be frightened, man—it won’t eat you—it’s only a noise, after all! But I’m glad you’ve heard it, because there are always people who think it’s the wind, or my imagination, or something. You won’t hear it again tonight, I fancy, for it doesn’t often come more than once. Yes—that’s right. Put another stick on the fire, and a little more stuff into that weak mixture you’re so fond of. Do you remember old Blauklot the carpenter, on that German ship that picked us up when the Clontarf went to the bottom? We were hove to in a howling gale one night, as snug as you please, with no land within five hundred miles, and the ship coming up and falling off as regularly as clockwork—“Biddy te boor beebles ashore tis night, poys!” old Blauklot sang out, as he went off to his quarters with the sail-maker. I often think of that, now that I’m ashore for good and all. Yes, it was on a night like this, when I was at home for a spell, waiting to take the Olympia out on her first trip—it was on the next voyage that she broke the record, you remember—but that dates it. Ninety-two was the year, early in November. Did you never hear that tale? The fourth husband managed to keep awake and caught her, and she was hanged. How did she do it? She drugged them, and poured melted lead into their ears through a little horn funnel when they were asleep… No—that’s the wind whistling. It’s backing up to the southward again. I can tell by the sound. Besides, the other thing doesn’t often come more than once in an evening even at this time of year—when it happened. Yes, it was in November. Poor Mrs. Pratt died suddenly in her bed not long after I dined here. I can fix the date, because I got the news in New York by the steamer that followed the Olympia when I took her out on her first trip. You had the Leofric the same year? Yes, I remember. What a pair of old buffers we are coming to be, you and I. Nearly fifty years since we were apprentices together on the Clontarf. Shall you ever forget old Blauklot? “Biddy te boor beebles ashore, poys!” Ha, ha! Take a little more, with all that water. It’s the old Hulstkamp I found in the cellar when this house came to me, the same I brought Luke from Amsterdam five-and-twenty years ago. He had never touched a drop of it. Perhaps he’s sorry now, poor fellow. He had an old dog that poor Mrs. Pratt had been fond of, and that used to follow her everywhere. He was a bulldog, and the sweetest tempered beast you ever saw, though he had a way of hitching his upper lip behind one of his fangs that frightened strangers a good deal. Sometimes, of an evening, Pratt and Bumble—that was the dog’s name—used to sit and look at each other a long time, thinking about old times, I suppose, when Luke’s wife used to sit in that chair you’ve got. That was always her place, and this was the doctor’s, where I’m sitting. Bumble used to climb up by the footstool—he was old and fat by that time, and could not jump much, and his teeth were getting shaky. He would look steadily at Luke, and Luke looked steadily at the dog, his face growing more and more like a skull with two little coals for eyes; and after about five minutes or so, though it may have been less, old Bumble would suddenly begin to shake all over, and all on a sudden he would set up an awful howl, as if he had been shot, and tumble out of the easy-chair and trot away, and hide himself under the sideboard, and lie there making odd noises. Considering Pratt’s looks in those last months, the thing is not surprising, you know. I’m not nervous or imaginative, but I can quite believe he might have sent a sensitive woman into hysterics—his head looked so much like a skull in parchment. I wondered what he meant, for the words slipped out as if he could not help saying them. I’ve understood since. He meant that he did not hear that noise so often after the dog was out of the way. Perhaps he thought at first that it was old Bumble in the yard howling at the moon, though it’s not that kind of noise, is it? Besides, I know what it is, if Luke didn’t. It’s only a noise after all, and a noise never hurt anybody yet. But he was much more imaginative than I am. No doubt there really is something about this place that I don’t understand; but when I don’t understand a thing, I call it a phenomenon, and I don’t take it for granted that it’s going to kill me, as he did. I don’t understand everything, by long odds, nor do you, nor does any man who has been to sea. We used to talk of tidal waves, for instance, and we could not account for them; now we account for them by calling them submarine earthquakes, and we branch off into fifty theories, any one of which might make earthquakes quite comprehensible if we only knew what they were. I fell in with one of them once, and the inkstand flew straight up from the table against the ceiling of my cabin. The same thing happened to Captain Lecky—I dare say you’ve read about it in his “Wrinkles”. Very good. If that sort of thing took place ashore, in this room for instance, a nervous person would talk about spirits and levitation and fifty things that mean nothing, instead of just quietly setting it down as a “phenomenon” that has not been explained yet. My view of that voice, you see. Of course, there was the ladle. I never told anybody about that, and, it made me start when I found it in the cupboard in the bedroom. It was new, too—a little tinned iron ladle that had not been in the fire more than once or twice, and there was some lead in it that had been melted, and stuck to the bottom of the bowl, all grey, with hardened dross on it. But that proves nothing. A country doctor is generally a handy man, who does everything for himself, and Luke may have had a dozen reasons for melting a little lead in a ladle. He was fond of sea-fishing, for instance, and he may have cast a sinker for a night-line; perhaps it was a weight for the hall clock, or something like that. All the same, when I found it I had a rather queer sensation, because it looked so much like the thing I had described when I told them the story. Do you understand? It affected me unpleasantly, and I threw it away; it’s at the bottom of the sea a mile from the Spit, and it will be jolly well rusted beyond recognizing if it’s ever washed up by the tide. You see, Luke must have bought it in the village, years ago, for the man sells just such ladles still. I suppose they are used in cooking. In any case, there was no reason why an inquisitive housemaid should find such a thing lying about, with lead in it, and wonder what it was, and perhaps talk to the maid who heard me tell the story at dinner—for that girl married the plumber’s son in the village, and may remember the whole thing. How? He was found dead on the beach one morning, and there was a coroner’s inquest. There were marks on his throat, but he had not been robbed. The verdict was that he had come to his end “By the hands or teeth of some person or animal unknown,” for half the jury thought it might have been a big dog that had thrown him down and gripped his windpipe, though the skin of his throat was not broken. No one knew at what time he had gone out, nor where he had been. He was found lying on his back above high-water mark, and an old cardboard bandbox that had belonged to his wife lay under his hand, open. The lid had fallen off. He seemed to have been carrying home a skull in the box—doctors are fond of collecting such things. It had rolled out and lay near his head, and it was a remarkably fine skull, rather small, beautifully shaped and very white, with perfect teeth. That is to say, the upper jaw was perfect, but there was no lower one at all, when I first saw it. Yes, I found it here when I came. You see, it was very white and polished, like a thing meant to be kept under a glass case, and the people did not know where it came from, nor what to do with it; so they put it back into the bandbox and set it on the shelf of the cupboard in the best bedroom, and of course they showed it to me when I took possession. I was taken down to the beach, too, to be shown the place where Luke was found, and the old fisherman explained just how he was lying, and the skull beside him. The only point he could not explain was why the skull had rolled up the sloping sand towards Luke’s head instead of rolling downhill to his feet. It did not seem odd to me at the time, but I have often thought of it since, for the place is rather steep. I’ll take you there tomorrow if you like—I made a sort of cairn of stones there afterwards. When he fell down, or was thrown down—whichever happened—the bandbox struck the sand, and the lid came off, and the thing came out and ought to have rolled down. But it didn’t. It was close to his head almost touching it, and turned with the face towards it. I say it didn’t strike me as odd when the man told me; but I could not help thinking about It afterwards, again and again, till I saw a picture of it all when I closed my eyes; and then I began to ask myself why the plaguey thing had rolled up instead of down, and why it had stopped near Luke’s head instead of anywhere else, a yard away, for instance. Then, don’t you see?—if it really was her skull, poor woman, the only way of accounting for his having it is that he really killed her, and did it in that way, as the woman killed her husbands in the story, and that he was afraid there might be an examination some day which would betray him. You see, I told that too, and I believe it had really happened some fifty or sixty years ago. They dug up the three skulls, you know, and there was a small lump of lead rattling about in each one. That was what hanged the woman. Luke remembered that, I’m sure. I don’t want to know what he did when he thought of it; my taste never ran in the direction of horrors, and I don’t fancy you care for them either, do you? No. If you did, you might supply what is wanting to the story. I don’t wonder you take me up on what I’m saying! First I tell you that I don’t want to know what happened, and that I hate to think about horrors, and then I describe the whole thing to you as if I had seen it. I’m quite sure that it was her work-bag that he put there. I remember the bag very well, for she always used it of an evening; it was made of brown plush, and when it was stuffed full it was about the size of—you understand. Yes, there I am, at it again! You may laugh at me, but you don’t live here alone, where it was done, and you didn’t tell Luke the story about the melted lead. I’m not nervous, I tell you, but sometimes I begin to feel that I understand why some people are. I dwell on all this when I’m alone, and I dream of it, and when that thing screams—well, frankly, I don’t like the noise any more than you do, though I should be used to it by this time. I may be all wrong about the skull, and I like to think that I am when I can. It may be just a fine specimen which Luke got somewhere long ago, and what rattles about inside when you shake it may be nothing but a pebble, or a bit of hard clay, or anything. Skulls that have lain long in the ground generally have something inside them that rattles don’t they? No, I’ve never tried to get it out, whatever it is; I’m afraid it might be lead, don’t you see? And if it is, I don’t want to know the fact, for I’d much rather not be sure. If it really is lead, I killed her quite as much as if I had done the deed myself. Anybody must see that, I should think. As long as I don’t know for certain, I have the consolation of saying that it’s all utterly ridiculous nonsense, that Mrs. Pratt died a natural death and that the beautiful skull belonged to Luke when he was a student in London. But if I were quite sure, I believe I should have to leave the house; indeed I do, most certainly. As it is, I had to give up trying to sleep in the best bedroom where the cupboard is. You ask me why I don’t throw it into the pond—yes, but please don’t call it a “confounded bugbear”—it doesn’t like being called names. I was always a good sleeper ashore; eight hours is my dose, eleven to seven when I’m alone, twelve to eight when I have a friend with me. But I could not sleep after three o’clock in the morning in that room—a quarter past, to be accurate—as a matter of fact, I timed it with my old pocket chronometer, which still keeps good time, and it was always at exactly seventeen minutes past three. I wonder whether that was the hour when she died? It was not what you have heard. If it had been that, I could not have stood it two nights. It was just a start and a moan and hard breathing for a few seconds in the cupboard, and it could never have waked me under ordinary circumstances, I’m sure. I suppose you are like me in that, and we are just like other people who have been to sea. No natural sounds disturb us at all, not all the racket of a square-rigger hove to in a heavy gale, or rolling on her beam ends before the wind. But if a lead pencil gets adrift and rattles in the drawer of your cabin table you are awake in a moment. Just so—you always understand. Very well, the noise in the cupboard was no louder than that, but it waked me instantly. After about a fortnight I had had enough of the noises. So far I had said to myself that it would be silly to yield to it and take the skull out of the room. Things always look differently by daylight, don’t they? But the voice grew louder—I suppose one may call it a voice—and it got inside my deaf ear, too, one night. I realized that when I was wide awake, for my good ear was jammed down on the pillow, and I ought not to have heard a foghorn in that position. But I heard that, and it made me lose my temper, unless it scared me, for sometimes the two are not far apart. I struck a light and got up, and I opened the cupboard, grabbed the bandbox and threw it out of the window, as far as I could. I did not sleep much more than night. It was not more than half an hour after I had thrown the bandbox out when I heard a shriek outside—like what we’ve had tonight, but worse, more despairing, I should call it; and it may have been my imagination, but I could have sworn that the screams came nearer and nearer each time. I lit a pipe, and walked up and down for a bit, and then took a book and sat up reading, but I’ll be hanged if I can remember what I read nor even what the book was, for every now and then a shriek came up that would have made a dead man turn in his coffin. To go back, I shut and bolted the hall door, picked the thing up carefully, and put it on the table beside the candle. I did that mechanically, as one instinctively does the right thing in danger without thinking at all—unless one does the opposite. It may seem odd, but I believe my first thought had been that somebody might come and find me there on the threshold while it was resting against my foot, lying a little on its side, and turning one hollow eye up at my face, as if it meant to accuse me. And the light and shadow from the candle played in the hollows of the eyes as it stood on the table, so that they seemed to open and shut at me. Then the candle went out quite unexpectedly, though the door was fastened and there was not the least draught; and I used up at least half a dozen matches before it would burn again. That’s all. I took the box upstairs to the cupboard, and put the skull back and locked it up. When the girl brought me my breakfast she said she was sorry, but that she must go, and she did not care if she lost her month’s wages. I looked at her, and her face was a sort of greenish yellowish white. I pretended to be surprised, and asked what was the matter; but that was of no use, for she just turned on me and wanted to know whether I meant to stay in a haunted house, and how long I expected to live if I did, for though she noticed I was sometimes a little hard of hearing, she did not believe that even I could sleep through those screams again—and if I could, why had I been moving about the house and opening and shutting the front door, between three and four in the morning? There was no answering that, since she had heard me, so off she went, and I was left to myself. I went down to the village during the morning and found a woman who was willing to come and do the little work there is and cook my dinner, on condition that she might go home every night. As for me, I moved downstairs that day, and I have never tried to sleep in the best bedroom since. After a little while I got a brace of middle-aged Scotch servants from London, and things were quiet enough for a long time. I began by telling them that the house was in a very exposed position, and that the wind whistled round it a good deal in the autumn and winter, which had given it a bad name in the village, the Cornish people being inclined to superstition and telling ghost stories. The two hard-faced, sandy-haired sisters almost smiled, and they answered with great contempt that they had no great opinion of any Southern bogey whatever, having been in service in two English haunted houses, where they had never seen so much as the Boy in Grey, whom they reckoned no very particular rarity in Forfarshire. They stayed with me several months, and while they were in the house we had peace and quiet. One of them is here again now, but she went away with her sister within the year. This one—she was the cook—married the sexton, who works in my garden. That’s the way of it. It’s a small village and he has not much to do, and he knows enough about flowers to help me nicely, besides doing most of the hard work; for though I’m fond of exercise, I’m getting a little stiff in the hinges. He’s a sober, silent sort of fellow, who minds his own business, and he was a widower when I came here—Trehearn is his name, James Trehearn. The Scottish sisters would not admit that there was anything wrong about the house, but when November came they gave me warning that they were going, on the ground that the chapel was such a long walk from here, being in the next parish, and that they could not possibly go to our church. But the younger one came back in the spring, and as soon as the banns could be published she was married to James Trehearn by the vicar, and she seems to have had no scruples about hearing him preach since then. I’m quite satisfied, if she is! The couple live in a small cottage that looks over the churchyard. Oh yes—I had not told you about the jaw yet. Trehearn found it in the garden last spring when he was digging a pit for a new asparagus bed. You know we make asparagus beds six or eight feet deep here. Yes, yes—I had forgotten to tell you that. He was digging straight down, just as he digs a grave; if you want a good asparagus bed made, I advise you to get a sexton to make it for you. Those fellows have a wonderful knack at that sort of digging. I’ll go upstairs and fetch the box in a minute. Let me light my pipe; there’s no hurry! We had supper early, and it’s only half-past nine o’clock. I never let a friend go to bed before twelve, or with less than three glasses—you may have as many more as you like, but you shan’t have less, for the sake of old times. I have often seen a man do insane things with his hands that he does not realize at all. I once saw a man hanging on by an old awning stop with one hand, leaning backward, outboard, with all his weight on it, and he was just cutting the stop with the knife in his other hand when I got my arms round him. We were in mid-ocean, going twenty knots. He had not the smallest idea what he was doing; neither had I when I managed to pinch my finger between the teeth of that thing. I can feel it now. It was exactly as if it were alive and were trying to bite me. It would if it could, for I know it hates me, poor thing! Do you suppose that what rattles about inside is really a bit of lead? Well, I’ll get the box down presently, and if whatever it is happens to drop out into your hands, that’s your affair. If it’s only a clod of earth or a pebble, the whole matter would be off my mind, and I don’t believe I should ever think of the skull again; but somehow I cannot bring myself to shake out the bit of hard stuff myself. The mere idea that it may be lead makes me confoundedly uncomfortable, yet I’ve got the conviction that I shall know before long. I shall certainly know. I’m sure Trehearn knows, but he’s such a silent beggar. Bother the candle, it won’t light! As if the ridiculous thing understood what it’s wanted for! Look at that—the third match. They light fast enough for my pipe. There, do you see? It’s a fresh box, just out of the tin safe where I keep the supply on account of the dampness. Oh, you think the wick of the candle may be damp, do you? All right, I’ll light the beastly thing in the fire. That won’t go out, at all events. Yes, it sputters a bit, but it will keep lighted now. It burns just like any other candle, doesn’t it? The fact is, candles are not very good about here. I don’t know where they come from, but they have a way of burning low occasionally, with a greenish flame that spits tiny sparks, and I’m often annoyed by their going out of themselves. It cannot be helped, for it will be long before we have electricity in our village. It really is rather a poor light, isn’t it? You may as well finish that glass while I’m getting it, for I don’t mean to let you off with less than three before you go to bed. You won’t have to go upstairs, either, for I’ve put you in the old study next to the surgery—that’s where I live myself. The fact is, I never ask a friend to sleep upstairs now. The last man who did was Crackenthorpe, and he said he was kept awake all night. You remember old Crack, don’t you? He stuck to the Service, and they’ve just made him an admiral. Yes, I’m off now—unless the candle goes out. I couldn’t help asking if you remembered Crackenthorpe. If anyone had told us that the skinny little idiot he used to be was to turn out the most successful of the lot of us, we should have laughed at the idea, shouldn’t we? You and I did not do badly, it’s true—but I’m really going now. I don’t mean to let you think that I’ve been putting it off by talking! As if there were anything to be afraid of! If I were scared, I should tell you so quite frankly, and get you to go upstairs with me. Now I’ll open the box, and we’ll take it out and look at it under the bright light. It’s rather awful to think that the poor lady used to sit there, in your chair, evening after evening, in just the same light, isn’t it? But then—I’ve made up my mind that it’s all rubbish from beginning to end, and that it’s just an old skull that Luke had when he was a student and perhaps he put it into the lime merely to whiten it, and could not find the jaw. Good Lord! Take the lamp—don’t let it go out, if you can help it—I’ll have the window fastened again in a second—I say, what a gale! There, it’s out! I told you so! Never mind, there’s the firelight—I’ve got the window shut—the bolt was only half down. Was the box blown off the table? Where the deuce is it? There! That won’t open again, for I’ve put up the bar. Good dodge, an old-fashioned bar—there’s nothing like it. Now, you find the bandbox while I light the lamp. Confound those wretched matches! Yes, a pipe spill is better—it must light in the fire—hadn’t thought of it—thank you—there we are again. Now, where’s the box? Yes, put it back on the table, and we’ll open it. Look here, please. I want you to see that the seal is intact before we open the box together. Will you take my glasses? No, you have your own. All right. The seal is sound, you see, and you can read the words of the motto easily. “Sweet and low”—that’s it—because the poem goes on “Wind of the Western Sea”, and says, “blow him again to me”, and all that. Here is the seal on my watch chain, where it’s hung for more than forty years. My poor little wife gave it to me when I was courting, and I never had any other. It was just like her to think of those words—she was always fond of Tennyson. If it was not Trehearn—oh, don’t talk to me about the possibility that the thing has got out by itself! If it has, it must be somewhere about the house, in some out-of-the-way corner, waiting. We may come upon it anywhere, waiting for us, don’t you know?—just waiting in the dark. Then it will scream at me; it will shriek at me in the dark, for it hates me, I tell you! I feel a little bit shaken up—not exactly nervous, you know, but badly shaken up, that’s the fact. Anybody would, I should think. After all, you cannot say that it’s fear of the thing, for I went up and brought it down—at least, I believed I was bringing it down, and that’s the same thing, and by George, rather than give in to such silly nonsense, I’ll take the box upstairs again and put it back in its place. It’s not that. It’s the certainty that the poor little woman came to her end in that way, by my fault, because I told the story. That’s what is so dreadful. Somehow, I had always hoped that I should never be quite sure of it, but there is no doubting it now. Look at that! Look at it! That little lump of lead with no particular shape. Think of what it did, man! Doesn’t it make you shiver? He gave her something to make her sleep, of course, but there must have been one moment of awful agony. Think of having boiling lead poured into your brain. Think of it. She was dead before she could scream, but only think of—oh! there it is again—it’s just outside—I know it’s just outside—I can’t keep it out of my head!—oh!—oh! Bury it? Yes, if we can find it, we’ll bury it, if it takes us all night. We’ll bury it six feet deep and ram down the earth over it, so that it shall never get out again, and if it screams, we shall hardly hear it so deep down. Quick, we’ll get the lantern and look for it. It cannot be far away; I’m sure it’s just outside—it was coming in when I shut the window, I know it. “Add together the altitude, the latitude, and the polar distance, divide by two and subtract the altitude from the half-sum; then add the logarithm of the secant of the latitude, the cosecant of the polar distance, the cosine of the half-sum and the sine of the half-sum minus the altitude”—there! Don’t say that I’m out of my senses, for my memory is all right, isn’t it? Come, we’ll get the lantern and go round the house. It’s not raining—only blowing like old boots, as we used to say. The lantern is in the cupboard under the stairs in the hall, and I always keep it trimmed in case of a wreck. No use to look for the thing? I don’t see how you can say that. It was nonsense to talk of burying it, of course, for it doesn’t want to be buried; it wants to go back into its bandbox and be taken upstairs, poor thing! Trehearn took it out, I know, and made the seal over again. Perhaps he took it to the churchyard, and he may have meant well. I dare say he thought that it would not scream any more if it were quietly laid in consecrated ground, near where it belongs. But it has come home. Yes, that’s it. He’s not half a bad fellow, Trehearn, and rather religiously inclined, I think. Does not that sound natural, and reasonable, and well meant? He supposed it screamed because it was not decently buried—with the rest. But he was wrong. How should he know that it screams at me because it hates me, and because it’s my fault that there was that little lump of lead in it? No use to look for it, anyhow? Nonsense! I tell you it wants to be found—Hark! what’s that knocking? Do you hear it? Knock—knock—knock—three times, then a pause, and then again. It has a hollow sound, hasn’t it? Will you come with me? We’ll take it in. Yes, I own that I don’t like to go alone and open the door. The thing will roll in and stop against my foot, just as it did before, and the light will go out. I’m a good deal shaken by finding that bit of lead, and, besides, my heart isn’t quite right—too much strong tobacco, perhaps. Besides, I’m quite willing to own that I’m a bit nervous tonight, if I never was before in my life. That’s right, come along! I’ll take the box with me, so as not to come back. Do you hear the knocking? It’s not like any other knocking I ever heard. If you will hold this door open, I can find the lantern under the stairs by the light from this room without bringing the lamp into the hall—it would only go out. The thing knows we are coming—hark! It’s impatient to get in. Don’t shut the door till the lantern is ready, whatever you do. There will be the usual trouble with the matches, I suppose—no, the first one, by Jove! I tell you it wants to get in, so there’s no trouble. All right with that door now; shut it, please. Now come and hold the lantern, for it’s blowing so hard outside that I shall have to use both hands. That’s it, hold the light low. Do you hear the knocking still? Here goes—I’ll open just enough with my foot against the bottom of the door—now! Catch it! it’s only the wind that blows it across the floor, that’s all—there s half a hurricane outside, I tell you! Have you got it? The bandbox is on the table. One minute, and I’ll have the bar up. There! Come inside again and let me see it by the lamp. I’ll bring the bandbox—never mind the lantern, it may just as well burn in the hall for I shall need it presently when I go up the stairs. Yes, shut the door if you will; it makes it more cheerful and bright. Is your finger still bleeding? I’ll get you the carbolic in an instant; just let me see the thing. Strange that the jaw should stick to it so closely, isn’t it? I suppose it’s the dampness, for it shuts like a vice—I have wiped off the drop of blood, for it was not nice to look at. I’m not going to try to open the jaws, don’t be afraid! I shall not play any tricks with the poor thing, but I’ll just seal the box again, and we’ll take it upstairs and put it away where it wants to be. The wax is on the writing-table by the window. Thank you. It will be long before I leave my seal lying about again, for Trehearn to use, I can tell you. Explain? I don’t explain natural phenomena, but if you choose to think that Trehearn had hidden it somewhere in the bushes, and that the gale blew it to the house against the door, and made it knock, as if it wanted to be let in, you’re not thinking the impossible, and I’m quite ready to agree with you. Yes—this is the door of the best bedroom. Hold up the lantern, please. This side, by the head of the bed. I left the cupboard open when I got the box. Isn’t it queer how the faint odour of women’s dresses will hang about an old closet for years? This is the shelf. You’ve seen me set the box there, and now you see me turn the key and put it into my pocket. So that’s done! 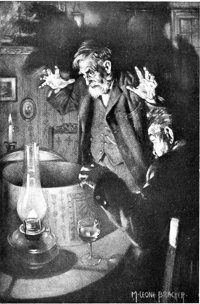 The coroner’s Jury returned the somewhat singular verdict that Captain Braddock came to his death “by the hands or teeth of some person unknown”. The local surgeon is said to have expressed privately the opinion that the maniac is a woman, a view he deduces from the small size of the jaws, as shown by the marks of the teeth. The whole affair is shrouded in mystery. Captain Braddock was a widower, and lived alone. He leaves no children. This entry was posted in Free Fiction, Halloween on October 18, 2013 by admin.